The Bru – Van Kieu live in small houses on stilts. These villages are usually located near rivers or streams and are always arranged along the water current flows. The houses are arranged in circles around a communal house on flat and expansive terrain. Young Bru – Van Kieu men and women are free to choose their partners. The maternal uncle says the last words at marriage or burial ceremonies for his nephews and nieces. He also has the decision power in house construction. Ancestor worship is the most common religious activity. Also, the Bru – Van Kieu pay veneration to sacred objects such as a sword or a fragment of a bowl, and they especially worship fire and kitchen deities. The Bru-Van Kieu language belongs to the Mon-Khmer culture. 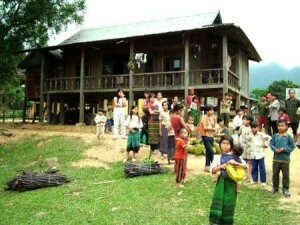 The Bru – Van Kieu love creative arts and maintain a rich treasury of traditional art and culture. They possess numerous musical instruments such as drums, castanets, knob gongs, wind instruments, and string zithers (including the a-chung and po-kua). Folk singing is popular as is cha chap (sung stories), and sim, an alternating chant between young men and women. Folksongs, proverbs, and old tales make up the rich culture of the Bru – Van Kieu. Both men and women wear like Tay Nguyen costumes. The Bru – Van Kieu live on rice cultivation, through slash and burn agriculture and submerging their fields. They also hunt, fish and rear cattle. Basketry and palm mat-making are their sideline occupations.